Our March meeting will be held at the Newburyport Public Library on March 5th. The library is located at 94 State Street, Newburyport, MA. There is parking available in the municipal parking lot where Harris Street intersects with State Street. We will have show and tell, and then have a demo on English Paper Piecing. Please bring fabric scraps that are around 5 inches square, scissors, needles, and thread to practice with. Announcing our Spring Speaker... Amy Friend! We're so happy to be able to have our founding president Amy Friend speak at our May meeting. 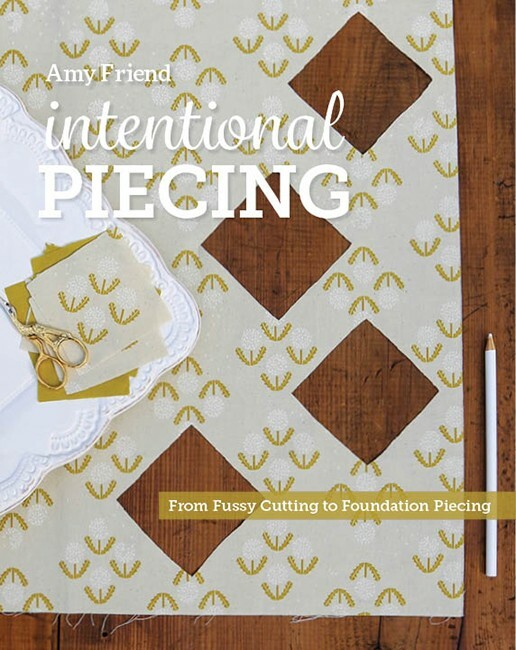 Her new book, Intentional Piecing, is all about fussy cutting, fabric placement, and really using your fabrics to elevate your quilt designs. And there's a trunk show with many of the quilts from the book as well as some extras. The talk will be held in place of our May meeting on the 7th, at the West Newbury Town Hall, at 10 a.m. This will be a free event for members, and guests are welcome with a $10 entrance fee. Books will be available for purchase at the talk. Fabric Extravaganza is happening in Nashua, NH on Feb 11. Many members have gone in the past to enjoy the annual clearance event by a number of local quilt shops. There are also two quilt shows that are currently accepting entries. The Vermont Quilt Festival will have a modern category this year! The deadline is very soon, Wednesday February 10th. Find more info and the entry form here. 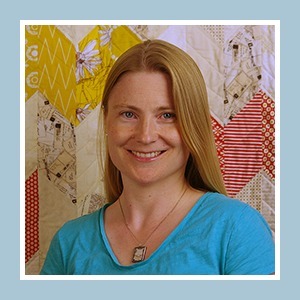 "Affairs of the Heat" Go Red For Women juried quilt show is asking quilters to use your creativity to express how heart disease has affected you, your family, or your friends. Entries need to be postmarked by 10/15 find more information here. Our QuiltCon charity quilt has arrived in California! It will be shown later this month during QuiltCon - be sure to keep an eye open on social media to see if anyone posts it. It's always fun to see our quilts out in the wild! 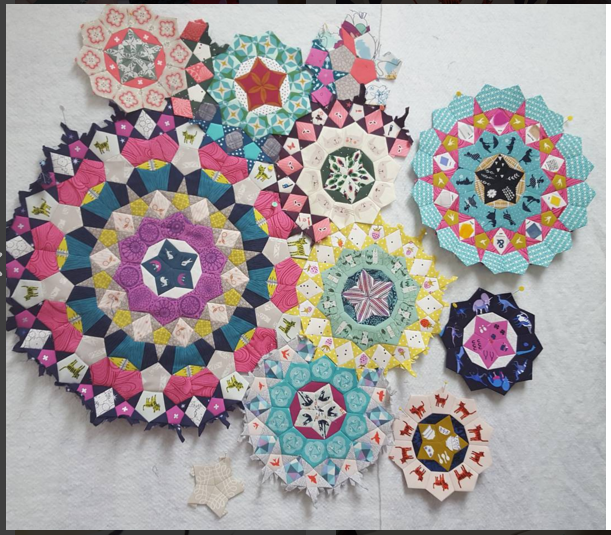 The wheelchair quilts that we made at the October meeting using the Jelly Roll Roace method will be donated to the Country Center Rehab in Newburyport and to the Rockingham County Nursing Home in Brentwood. The executive committee is working on drafting some policies- these are going to be mostly a firm description of how we have already been functioning. They will be emailed out before the next meeting to be voted on in March. We had a really impressive show and tell this month! We make cool stuff! Kate kicked us of with this pair of cute mini quilts she made using her new paper piecing skills! Kate also showed off this fun quilt made with novelty fabrics. Laura finished the quilting on the mini quilt she was working on last month and is happy to report that the flock dot chambray quilted and washed up great! Laura also finished this quilt that she started in a class with Latifah Saafir at the Gathering quilt show in November. The quilt is made using bias tape to put on those gentle curves. A new member, Kathy, showed off some of her creations for us. This quilt was made using a variety of paints and glues to add texture to the landscape. 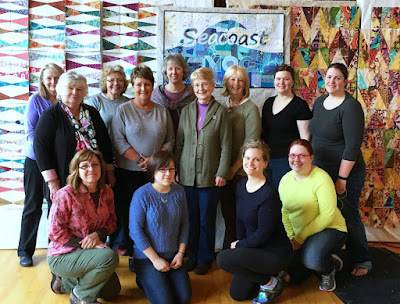 She made this quilt using pieced strips and a wedge ruler. How awesome is the optical illusion in this! These were Kathy's experiments with bias tape for the Mighty Lucky quilt challenge in January. Jane showed off the finished quilt from the quilt top she brought to her first meeting. Those flying geese borders really look great! And how awesome is the back too! Judy made some of the blocks from our sew in last month into quilt tops to send along to England where they will be finished up. Don't all of these economy blocks look like they were made to go together? Another good reminder that it is such a versatile block! Jane had come with most of these blocks pre made to the last meeting to donate and when added with the economy blocks made at the meeting and paired with that blue solid they made such a wonderful quilt! Some child is going to love it! Thanks to Judy for putting in some more time on these! Amy showed off her recently finished bee quilt that she made with some friends. All of the blocks are sewing themed! Paula also passed the "high five hand" along to Amy as a recognition for being one of the founding members of our guild, with Peg and Becca, and giving us all a reason to come together. She also acknowledged all of the hard work that she has put in the past year professionally and in writing her book which is due out this spring. Jane showed off her finished mini quilt that used the Mighty Lucky quilt challenge as the inspiration. She also showed off this quilt that she made with a FQ bundle originally bought from the Fabric Extravaganza in Nashua. Nancy brought this spool quilt that she finished, I believe that she worked on this at last year's retreat. Barb finished off one of our charity quilts from the October meeting for us, and brought her Mighty Lucky quilt challenge block to show. Once complete this will be an ice skate! How cool! Suzanne showed this baby quilt, and also her "Practice makes you better" quilt that was her first practice piece on her new longarm! Very exciting! After viewing all of these great projects we got down to business and sewed (and maybe ate some pizza and snacks). In March we will be meeting at a new location, the Newburyport Public Library. We will be talking about English Paper Peicing, or EPP. Please bring some fabric scraps that are around 5 inches square, needles, thread, and a pair of scissors. It's time again for another Retreat Payment! We're so excited to have such a large group going this year, and that we've been able to accomodate a few guests. The retreat committee is working hard to make sure that all of you have a great time. You'll have a couple options as to how you'd like to pay. I've added two different Paypal buttons here, one for a half payment (you'll pay the remainder in March) and one is to just pay the whole thing now. You can also choose to pay via check to Jess at the next meeting. Either way, payment is due by February 15th. Thanks to all of you who will be joining us, it's going to be fun!